A basic, no frills boozer just off the High Street, this is clearly quite an old building with a few original features although it lacks much in the way of any “olde worlde” charm. It’s a single room, U-shape layout wrapped around a central bar with a rough wooden floor. Seating is mostly around the perimeter with a mixture of chunky wooden tables and leather armchairs. There is quite a bit of exposed stone work on the walls and elsewhere the walls are whitewashed. A large stone fire-place is off to one side and a plasma stuck on the wall next to it which was showing a sports channel, although the volume was off so this was not too intrusive. There were a couple of fruit machines opposite the bar. A large recess to the right must have been an impressive fire-place at one time but has since been whitewashed and turned in to a seating area. A darts board was at the rear and a match was in progress on a recent Monday evening visit. A friendly pub dog turned up and encouraged us to throw his stick for him and there is a garden at the rear. Food is offered at lunch times, although I didn’t inspect the menu. The solitary been on tap was Doom Bar and the only cider was Strongbow, unfortunately. Not perhaps that appropriate to include a picture of rival pub The Cannon on the entry for this pub and in all this perhaps reflects a slight lack of attention to detail. The timbered interior is gorgeous and gains nothing from the addition of metallic silver pumps for lager and fruit machines. The garden is a decent enough spot for the canines to romp in but this could do with restoration from more sympathetic hands. Bloody nice Pub! Good Coal Fire in Winter and comfy seats (fight for it tho! ), Summer out in Beer Garden, smasing great....attracts many locals (particularly young at times), however ignore "label" it got over many years, still a good country pub for old gits like me! 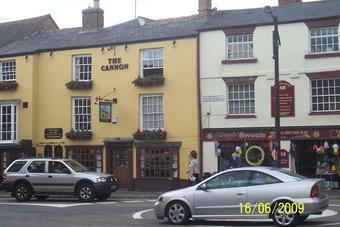 Good atmosphere,good selection of Ale and Lager,popular with the 18-30's and ok for watching sport.